Thanks to some "leaked" articles from Dengeki Playstation magazine we get to know the first details about the recently announced Persona 5 and Project Div.... I Mean Persona 4: Dancing All Night. 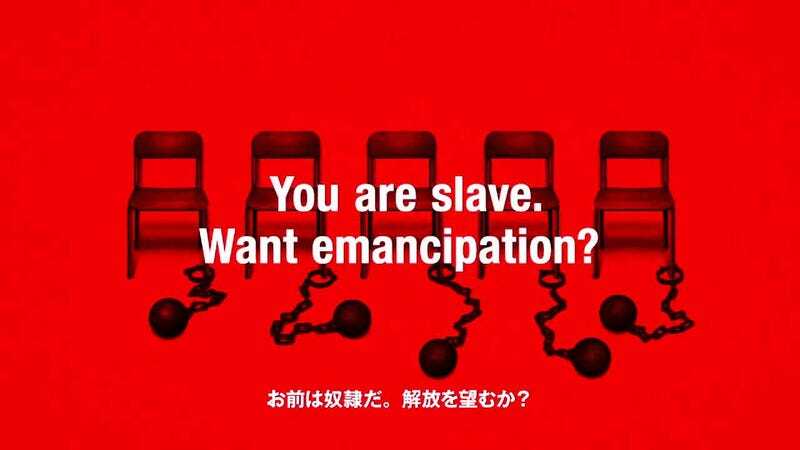 They say that Persona 5 is a RPG with the message of expressing the emotional catharsis in the shout of joy made after overcoming your trials and finally being set free of your chains. So we can pretty much speculate than stress from student life would be a major element of the game, maybe you need to past your test first in order to access the dungeon and that somewhat would explain the chains in the chairs don't you think? So it seems the game will indeed have a plot, and we need to play P4U2 before this to get it, and so now I'm more excited about this. Seems like Persona news aren't stopping these days huh? Not only the first Persona 3 movie was shown on theaters in Japan, the second part was announced for summer 2014, then a bunch of games, and even a Play, Wow. Now time to have fun, what do you think the chairs in the trailer meant?